Coming to another Dream Theater project for review is always a grand and entertaining time, but also a daunting task. They are exceptionally talented musicians with a profound catalog of inventive music. let's just say it, they're progressive metal royalty. So here's Live at Luna Park, their first concert DVD in five years and the first with new drummer Mike Mangini. 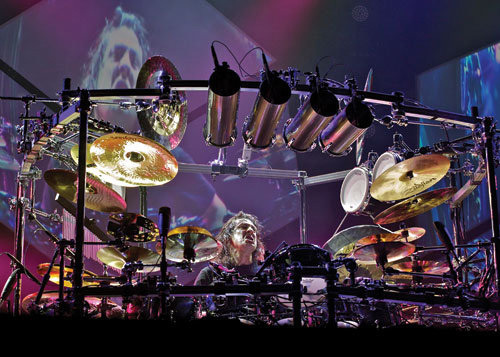 Mike Mangini: in his man cave. It should be noted at the start that this video is not a recording of one single show from their two nights in Buenos Aires in 2012. Rather it's a compilation of the two shows, with bonus tracks providing the missing parts. That's not a bad thing. But it's curious that for main video DT chose the Metropolis Pt. 1 encore rather than the more popular song Pull Me Under. Even more curious is that that latter song was only performed on the second night. Since we all know how good this band is, it's not really necessary to comment on the musicianship. It's simply awesome. Perhaps a few words should be said about Mangini's performance: he's a damn good drummer with some very humorous facial expressions. As for the video production, the camera's are every where, high, low, from the stage, from behind a fan recording his own video on his smart phone. (You get a few too many shots of some guy (the drum tech?) sitting on his when the camera moves in on Mangini.) You get lots of tight shots on every musician, especially for solos, so you guitar geeks can freak out over Petrucci's fret work, for instance. I wasn't sure if I was happy with the sound at all times as LaBrie sounded a bit lost in the music on some songs. But the mix grows on you, and if you're true fan, you know all the lyrics by heart anyway. As for song selection, there's a good cross section from past and present. Since they were touring in support of A Dramatic Turn of Events, you would expect them to play some of those songs. Well, the play all nine making up nearly half of the show. Half way through DT pauses for a quiet time with a four piece string quartet (from the local area) backing them up for The Silent Man, Beneath The Surface, Far From Heaven, and Wait For Sleep, the latter two found within the bonus tracks. They're all quite impressive and moving pieces arranged this way. One final song should be mentioned and that's the fan favorite, The Spirit Carries On, another touching and emotional piece. I swear I though I saw a few women crying, a nice camera angle. Finally, a few words about the bonus materials (as opposed to the bonus 'tracks'). Bonus materials can be great if they're interesting and well done, which is the case here. The Behind The Scenes does exactly that showing you how video production is done: it's rather complex, but they record as if they were recording for live television. The director's actually have more than a set list to work with. They actually know what's going on in every song. So if Rudess is going to have a keyboard solo, the know exactly when to bring the camera in. Perhaps the best bonus is the Documentary where it takes you from before the show, for dinner with the band (Mangini likes his filet medium rare) to the end of the show for post show commentary by band members. Mangini likes to eat right away and get out of his sweaty underwear. Yeah, I know, too much information. But the best part about the Documentary is the beginning where, through archive video and band conversation, the four members of Dream Theater talk about hiring Mike Mangini as their new drummer. It's a small, but very interesting and moving, look into the band, their desires, and how they see themselves as family. Bottom line: get this DVD, easily recommended. Dream Theater's Live at Luna Park is one of the best DVD concert videos that you will find this year.